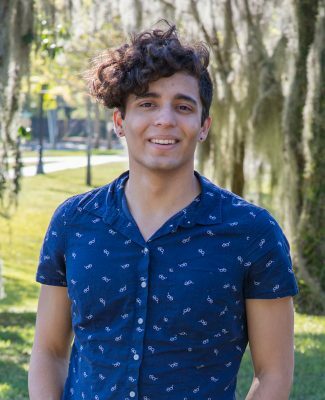 During his time at Stetson, Luis Melecio-Zambrano ’18 was emblematic of the increasing diversity of the university. Even more so, as he evolved as a student, he became an agent of change across the DeLand campus. Growing up with an Air Force father, Melecio-Zambrano went to high school in Niceville, a small town in the Florida Panhandle of more than 90 percent white residents. His father, originally from Puerto Rico, and his mother, from Venezuela, met in Tennessee. He was born in Venezuela, where his father was stationed. Certainly not typical. Similarly, Melecio-Zambrano mixed chemistry with music, receiving a Bachelor of Science while minoring as a vocalist. Uncommon. Melecio-Zambrano called the phenomena of chemistry, such as the interaction of visible light with molecules, “beautiful,” also noting that “it captured me.” Arriving on campus with an interest in environmentalism but not quite sure of a specific course of study, Melecio-Zambrano fell in love at introduction, simply by taking a class in organic chemistry. “When I went into the class, I came out and there was just this power of explanation and of parable-solving that I hadn’t seen elsewhere,” said Melecio-Zambrano, who now will attend Cornell University to pursue a doctorate in chemistry. Through it all, Melecio-Zambrano was making a difference outside the classroom, too. Melecio-Zambrano (far left) joins others at the Cross Cultural Center on campus. As a first-year student in fall 2014, he found a strong Hispanic population but one that lacked community, he described. 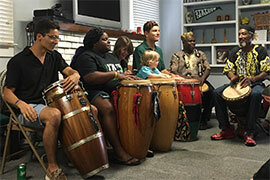 A year later, he became president of Unidos, Stetson’s Latin American student association. Previously, the group had been called H.O.L.A. (Hispanic Organization for Latin Awareness). Melecio-Zambrano helped to raise its profile. In addition, Melecio-Zambrano served on the university’s Inclusive Implementation Strategy Group, which included representatives from staff, faculty and students. The group worked (and continues) to foster inclusive excellence at Stetson, addressing questions such as how to balance freedom of speech with issues of making certain that everyone feels safe and comfortable? “We have to enable complex dialogue and attempt to generate people who come out of the university better than when they started. I think that requires difficult dialogue; I believe it,” he commented. In turn, the Stetson community helped Melecio-Zambrano grow as a person. In his first year, when he learned that a close friend was diagnosed terminal breast cancer, Melecio-Zambrano was in need of help as disbelief turned into despair. The help was there for him. And, in his final semester this past spring, amid clouds of more worries about that same friend, more help emerged. Melecio-Zambrano gave to Stetson, and the university returned the favor.